Kurisumala Ashram is at the heart of the Sahya Mountains, which run parallel to India's south west coast. It is a place sanctified by the breeze which blows softly across the valleys and by the overwhelming beauty of the creation, and the mediative thoughts which arise from the depth of silence. Even today people move to the mountains in search of peace of mind and of God-experience.What we write here about Francis Acharya, the head and architect of the Ashram, was heard from the sadhakas of Kurisumala. Mountains are the place of God-experience. In the wilderness of Sinai, Moses the prophet heard great revelations. Jesus loved to retire to the mountains, in the silence of the night to have a colloquy of love with His Father.The spirituality of understanding is all-pervading here. Today Kurisumala has become the Mount of Transfiguration, as it gives to all who come to the Ashram for a visit or to spend a few days, the feeling that, " It is good to be here", as Peeter said on Mount Tabor. Here the seeker's soul realizes the commands of God. Here are relevantly assembled 'Om karam', the primordial sound of the ancient seers of India and the Cross. Kurisumala Ashram, a monastery for Christian ascetics, who have belief in the Christianity along with the Indian spiritual beliefs, is worth visiting a place in Vagamon.Kurisumala is a Christian pilgrim centre and one of the main attractions at vagamon. The main day of attraction is on Good Friday. This is where hundreds of devotees from far and near converge during the holy week and after to climb the hill carrying wooden crosses. Kurisumala Ashram is a community of spiritual seekers who have become one in the spirit. The spiritual light of Kurisumala is the Acharya, the leader of seekers. The history of Kurisumala Ashram is the history of Acharya. It was in 1955 that John, at baptism, a Belgian by birth, but brother Francis as a Cistercian monk, and an Indian citizen since 1968, reached Kerala. He was prompted by an inner call, a call to a new life. He had travelled all over India to have a direct knowledge and experience of Her people. He felt, as by touch, the spiritual nature of India through learning, travelling and spiritual seeking. He visited and stayed in most of the great Ahrams of India. In 1950, Abbe J. Monchanin (Swami Parama Arubi Ananda), a French missionary priest and H. Le Saux(Swami Abhishiktananda), a Benedictine monk, had founded the Christian way of life on the bank of river Kaveri, near Trichy (Tiruchirappally). 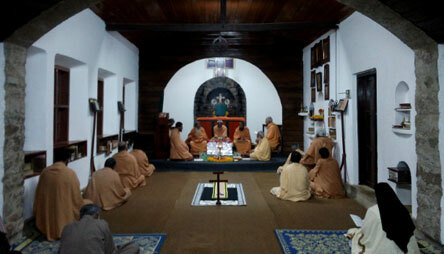 Saccidananda Ashram, Shantivanam, was a Christian Ashram, based on Indian spiritual tradition. 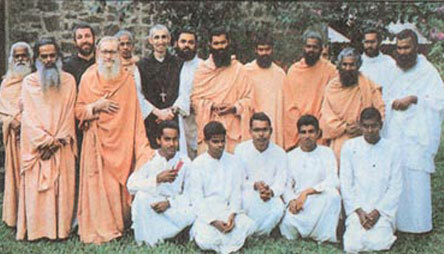 Br.Francis joined them and studied with them for a long time. He was specially interested in the Ashram life-style. John had come under the influence of Mahatma Gandhi when he was studying in London in1931. Gandhiji who had come for the Round Table Conference of the British Dominions had been contemptously spoken of as a half-naked fakir, yet it was in his simple Inidan dress that he led the delegates into Bucckingham Palace for an audience with Queen Mary. The nobility of his character and the simplicity of his life deeply touched John's heart. This influence promoted John to study the ancient culture of India to which he was from now on looking as to the land of Promise for him. It was in 1955, after clebrating Chritmas night in a small village at the fiitgukks if tge mountains, that Zacharias Mar Athanasios, Bishop of Tiruvalla, a Syrian Catholic Church, invited Fr. Francis to make a monastic foundation in his diocese. It was therefore quite procidential that a few months later a gift of 88 acres of virgin land, in the Sahya Mountains was offered to him by Shri. K.V. Thomas Pottenkulam. Fr. Francis was then still alone but there was no delay in the fulfilment of his dream. Soon an English Benedictine monk offered to help him and, when they had settled on the land and built a small monastery for some twenty monks, in spite of the isolation and quasi-inaccessibility of the place, within three years, the community counted 15 members. At present they are 20; 16 'sannyasis', 1 'brahmachari' and 3 'sadhkas'. Acharya does not wish the number of members to exceed twenty. Their life is dedication to God and neighbour. They ignore their own likes and dislikes. Five of them are priests. Ordination is given only when a priest is needed for Holy Eucharist and other sacramental ministries. He who is to receive ordination is selected by Acharya. They depart form their house and family for ever, there are no official home visits, but their families come to visit them at the ashram. Acharya was not interested to develop the community into a non astic order. It is so, that the number of members is restricted. Several 'sannyasis' founded Ashrams in other parts of Kerala, in Tamil Nadu and Karanataka, some who were members of this Asharam joined the Missionaries of Charity of Mother Teresa, working in leprosy colonies and homes for mentally handicapped. But, with a view to assure the future of the community they sought affiliation with Acharaya's former monstic order and were officially incorporated in the order od the Cistercians of the Strict Observance on May 24, 1988. 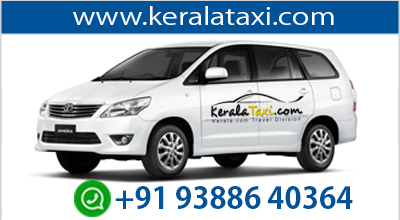 The most important feature of Kurisumala is its silence which truly pervades the Asharam. The silence is broken there only by the sweet sound of wind and birds which bring a quasi-divine message. The sadhakas listen to the whisperings of the spirit. They experience that the concentratoion of prayer is 'aanandamaya' , full of joy. All beings originate from Ananda, joy. They live in Ananda and they return to Ananda. Gandhiji said : "Experience teaches that silence is the strength of all seekers of truth". These words of Ganhiji, and the Inidan monstic life-style prompted Acharya to give an important place to silence in the Ashram. He keeps day silence. Rock-hewn caves, solitary hermitages and trees, which recall to the mind of Buddha's enlightenment, favour meditation. It is a divine experience offered to visitors to participate in the sadhakas ascentiscim and contemplation through communion with nature. They welcome people of all, because even the guests who come from far and nar pray with " the Harp of the Spirit", like us, and expand or koinonia, our communion to the four quarters of the earth". Kurisumala is a mountain from where milk and honey are flowing. 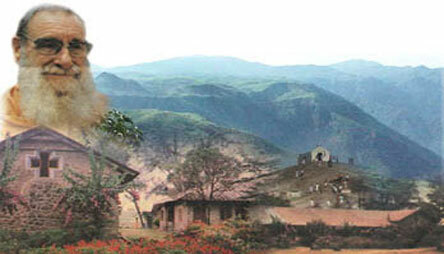 Honey is found in the rocky clefts of this mountain, where bees make their hives. The means by which the monks make their livelihood is the breeding of cows. Around 1500 litres of milk are produced or collected here. About 100 families live by breeding milk cows in co-operation with the Ashram farm. Milk collected here is distributed in the plains. Thus the milk which is needed for the spiritual and bodily growth, benefits people who lice in the cities. Acharaya received the formula of bread-labour from Gandhiji who taught that in every work there is glory. They spend about five hours daily for culitivation, cooking and keeping the house. The monks who consider food as God's gift do not allow even guests to waste food. A share is always given to the poor. The place where the monks, who have been called to the presence of the heavenly Father rest, is on the top-most area of the land, called "Resurrection Garden". It is interesting to know the day to day life of the Asharam. They join meditation and devotion, study and service in life. A day is divided almost equally in hours for prayer, study, work and rest. Prayer starts at 4.00 a.m. in the morning. As was common in the early monastic tradition they maintain the spirit of prayer in the various works of the day. Prayer with the Harp of the Spirit, in 4 vols., is their main prayer book. Immersed in asceticim and prayer for 25 years Acharya translated this from the Syriac Penqitho of Mosal in the Anthiochen liturgical tradition. Satsang, in the evening is a common feature in Indian Ashrams long practised at Krisumala. This is an ooccasion for a, monks and guests, to join more freely in bhajans and spiritual songs. The traditional Upasana meditation, consisting in sravana, the inner listening, manana, the active reflcetion, and nididhasana, the contemplative concentraction is also used. The Sadhakas who recite all the day, Om Shri Yesu Bhagavate Namah (I bow before you, Jesus) in their heart and on their lips, pray to that beloved : Om, Lokah Samastha, Sukhino Bhavantu', (Om, May all the world be happy!). The formation of the sadhakas takes place in the community with the help of the experienced senior members.